Good news about climate change from an amazing source! Summary: Today we have several pieces of good news about our changing climate. It is good news from an amazing source. Extraordinary news from The Guardian! by Tamsin Edwards at The Guardian. The bien pensants at The Guardian are credulous consumers of climate doomster stories. So this science news story is extraordinary. It debunks a long-time favorite story of the Left about the coming end times, when Antarctica slides into the sea. See this excerpt of the opening and closing (red emphasis added). “I was particularly concerned about some of the implied time scales and impacts. That ‘slowly burying every shoreline …creating hundreds of millions of climate refugees …could play out in a mere 20 to 50 years’ (it could begin then, but would take far longer). That ‘the full 11 feet’ could be unlocked by 2100 (Rob and Dave predicted the middle of next century). That cities will be ‘wiped off the map’ (we will adapt, because the costs of protecting coastlines are predicted to be far less than those of flooding). We absolutely should be concerned about climate risks, and reduce them. But black-and-white thinking and over-simplification don’t help with risk management, they hinder. Tamsin Edwards is a lecturer in environmental sciences at the Open University (profile here). She blogs at the PLOS website, All Models Are Wrong. For three decades the Left has given confident predictions increasingly dire scenarios about out ever-changing climate. The latest: the end of humanity and devastation of the Earth — predictions with little support in the peer-reviewed literature or work of the IPCC. For example, the 10 July 2017 issue of NY Magazine featured “Uninhabitable Earth” by David Wallace-Wells — “Famine, economic collapse, a sun that cooks us: What climate change could wreak — sooner than you think.” This was the most-read article it its history. (see this excerpt in The Guardian). This campaign to influence US public policy — the largest in our history — has been almost totally ineffective. Has the Left realized this and returned to relying on science to inform to public — rather than exaggerations and partial truths to terrify people? That would mean using the work of the IPCC and major climate agencies (rather than cherry-picking bits and pieces), and above all looking at the full range of scenarios used in IPCC’s Fifth Assessment Report. That would be a radical change from their past. For example, manufacturing nightmares by misrepresenting its worst-case scenario (RCP8.5) as the result of business-as-usual trends. For example, RCP8.5 makes the unlikely assumption that coal becomes the major fuel of the late 21st century, as it was of the late 19th century. Another example: see the news misreporting a big GAO report about climate change. One of the countless climate “tipping points” we passed was in 2007 — “Scientists: ‘Arctic Is Screaming,’ Global Warming May Have Passed Tipping Point” (AP). “Greenland’s ice sheet melted nearly 19 billion tons more than the previous high mark, and the volume of Arctic sea ice at summer’s end was half what it was just four years earlier, according to new NASA satellite data obtained by The Associated Press. For an update see “Tricky Sea Ice Predictions Call for Scientists to Open Their Data” by Alexis Madrigal at Wired. “In 2007, the extent of sea ice in the Arctic declined rapidly. The drop from the previous year was so precipitous that it garnered worldwide attention and media coverage. In the last couple of years, the extent of sea ice in the Arctic, measured by the amount of square miles it covers, has recovered. This series of events, which underscored the year-to-year variability of the measurement, has made researchers cautious about describing events in the Arctic. 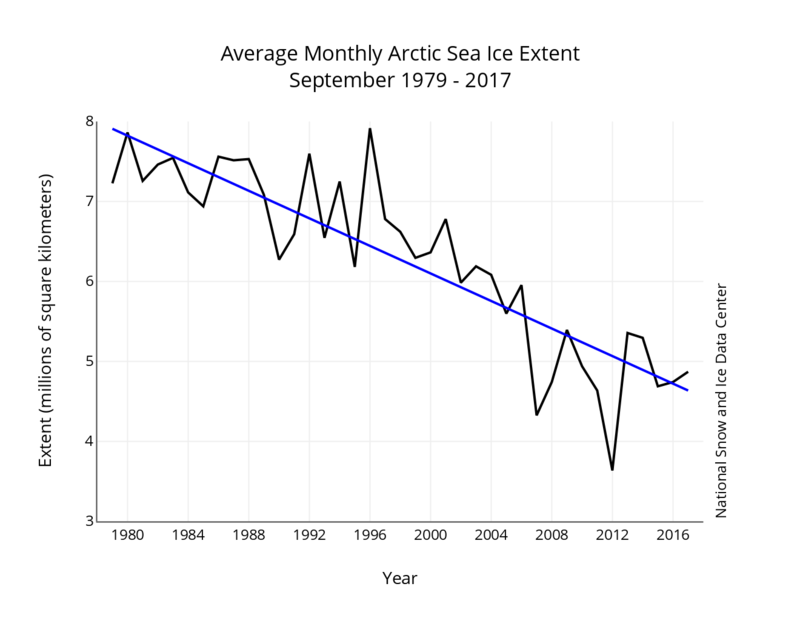 Average arctic sea ice area in September 2017 was the seventh smallest on record (since 1979). It has been flattish during 2007-2017. First, it means the alarmists have been proven wrong yet again. Likewise, their claims that the IPCC and climate agencies are “too conservative.” Second, that journalists lust for clickbait stories produces unreliable news. Focusing on worst case climate futures doesn’t work. It shouldn’t work. As always, we start with Summary for Policymakers of the IPCC’s AR5 (2014). (1) Widely misreported so that “Pine Island Glacier” became “Antarctic”: “Retreat of Pine Island Glacier controlled by marine ice-sheet instability” by L. Favier et al. in Nature Climate Change, February 2014. (2) “Marine Ice Sheet Collapse Potentially Under Way for the Thwaites Glacier Basin, West Antarctica” by Ian Joughi et al. in Science, 16 May 2014 (gated). (3) “Changes to Circumpolar Deep Water” by Bethan Davies at AntarticGlaciers.org, 15 September 2014. (6) “Contribution of Antarctica to past and. future sea-level rise” by Robert M. DeConto and David Pollard in Nature, 31 March 2016 — “Antarctica has the potential to contribute more than a metre of sea-level rise by 2100 and more than 15 metres by 2500, if emissions continue unabated.” Note the wild alarmism of that. 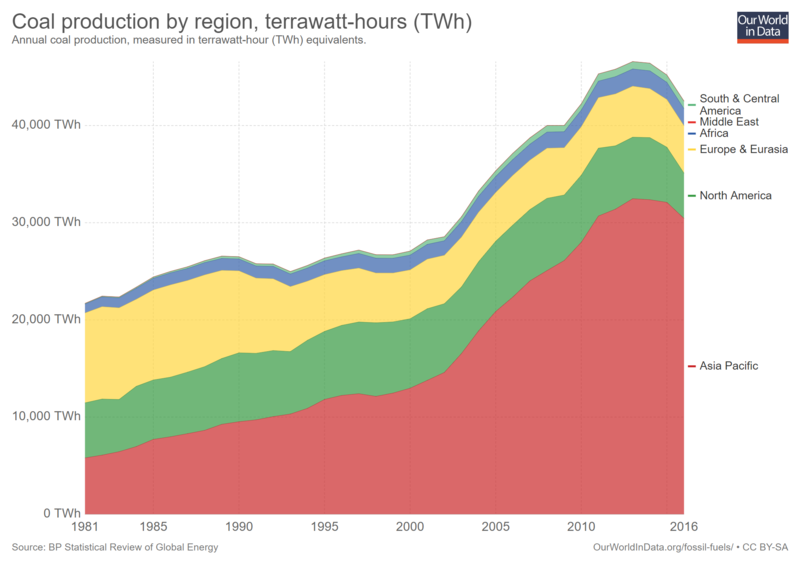 There are no reliable estimates of fossil fuel resources that allow “unabated” burning in the 22nd century, let alone through to the 25th century. (8) Edwards described this paper as “less pessimistic”: “Widespread movement of meltwater onto and across Antarctic ice shelves” by Jonathan Kingslake et al. in Nature, 20 April 2017. (9) Also see “Hot News from the Antarctic Underground“, the NASA press release about volcanic heating of Antarctic sea ice. Here is the study: “Influence of a West Antarctic mantle plume on ice sheet basal conditions” by Helene Serouss et al. in the Journal of Geophysical Research: Solid Earth, September 2017. Look at the trends in extreme weather & see the state of the world. Save the world from climate threats, myths and fears. From “Fossil Fuels” by Hannah Ritchie and Max Roser. I saw Tamin Edwards’ article and noted it as a rare break in the consensus narrative. I’ve also seen the backlash Ms. Edwards has suffered on Twitter, but it has appeared she’s holding up well. The danger, of course, is that she’s reluctant to go off-narrative in the future. Yes, that is how paradigms are defended in science. It’s a brutal and often unfair process, showing how science is not a mystical search for truth but a specific kind of sociological process. I find it odd that Thomas Kuhn’s The Structure of Scientific Revolutions is one of the most-cited and frequently read books about science — yet its conclusions are mostly unknown or misunderstood. I’m not familiar with that. I’m no scientist; I just follow the climate thing as a hobby. Would that be a valuable read for a layman? I strongly recommend reading The Structure of Scientific Revolutions . It is a transformative book. After reading it you will see articles about science, past and present, in a different light. Much behavior that seemed irrational will appear as rational. People’s behavior at work is seldom irrational. Usually that conclusion results from not seeing the world as the others do. 45 years ago Kuhn’s work was required reading for a Humanities course I took. Sounds interesting! What does this book tell us about the operation of Science? I obtained the Winchester work back in 2006 during a walk about in a university library. The author covers the scientific debate leading to the acceptance of plate tectonics. His approach of using real life examples of what happens when they (the plates) move made the telling of the story (telegraph enabled) rather interesting. Thank you for the explanation. That is an interesting real-world application of Kuhn’s theory! I always thought that there would be a kind of balance if there was a lot more precipitation worldwide under a slightly higher global temp – since some amount of that would fall on Greenland or in the Himalayas (maybe also Antarctica) and form snowpack and eventually glaciers. That never seemed to come up much, although I would not be shocked if it was considered and found to still be a net deficit. I suspect that if nothing else we’ll be able to make much better climate models in a hundred years (not that it will do me much good in this lifetime) just due to accumulated data. Might have to worry about the waste heat from our fusion reactors then. See what the Summary for Policymakers of the IPCC’s AR5 says about precipitation — the headline conclusion (in red at the top of the chapter). It also gives some speculation about regional changes — weakly described as “likely”, because today’s climate models do regional predictions with much less reliability than global changes. Good stuff, thanks for the links! You’ve been at this a lot longer than I have.I suppose I internalized the repetitions of “well there’s going to be worse rainstorms, Natural Disasters Are The New Normal” just because people keep blaring it on and on. Half the time I think I would be better educated if I read less news and more books – even if they were just novels. Exactly. People’s opinions are formed involuntarily by repetition. That’s the key to successful propaganda.